In reading the introduction of his first book Diesels and Dinosaurs, I get a vivid visual image of a young Steve Fitch speeding down a two lane highway in back of his father's 1951 Buick. This lead me to recount my own experiences as a child watching the road fly by out of the window of my parents car — I believe that experience must be stuck in many peoples minds. My focus was always trees silhouetted against the sky -- Fitch was fascinated with small towns, glowing neon signs and 18-wheelers roaming the highway. 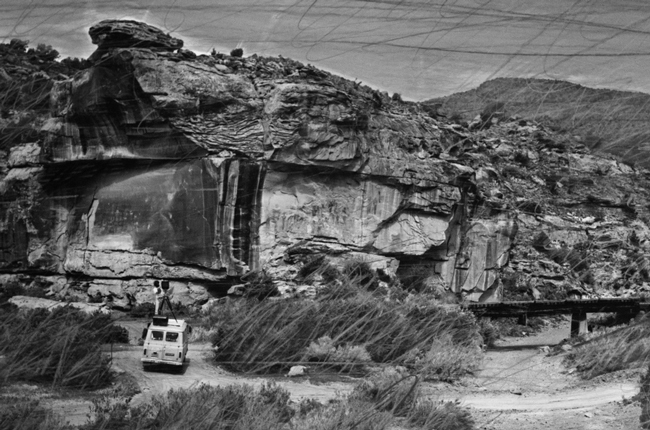 Anne Kelly: In your introduction of Diesels and Dinosaurs you vividly describe your experience as a kid traveling down the highway in your fathers 1951 Buick – you reflect on perceiving your observations as “Raw American Voodoo.” It seems clear to me that these childhood adventures inspired the photographs that you have made in your adult life. Steve Fitch: No question about it -- the trips I took with my family as a kid had a big influence on the photographs that I have made as an adult. Although I didn't realize it at the time, the photographs I was making that ended up in Diesels and Dinosaurs were very much an homage to the two lane highway and the kind of trips my family took when I was a kid. We would travel from northern California to the family farm in South Dakota where most of my relatives lived. We would stop at all these tourist places along the way (like snakepits, dinosaur parks and rock shops) and stay in funky, neon lit motels. The journey of getting to South Dakota was as important as actually getting there. Today, with interstate highways and jet travel, the journey has been diminished. Flying on a jet somewhere is more like an amusement park ride than a journey. With my photography I have been interested in the "vernacular of the journey" ever since the first pictures in Diesels and Dinosaurs. AK: Did you ever take any photographs as a child when you were on family trips – or if not did you have the desire to? SF: No, I don't think that I ever took photographs on these trips. I started making photographs when I was in junior high school but by then I wasn't traveling so much with my parents. But my father did take photographs. He was a serious amateur photographer who made a lot of 35mm Kodachrome slides (many of which I have today). In fact, in Diesels and Dinosaurs there is a black & white reproduction of one of his slides in my introductory essay. I have a vivid memory of one night when we were pulling into a small, desert town after a thunderstorm, The streets were wet and there were a ton of neon reflections bouncing off of the pavement. One time many years later I was going through my fathers slides and I found one taken at night in Wells, Nevada that I swear was a photograph that matched my memory. That was incredible to me: finding an actual color photograph of a memory! AK: You have a degree in both anthropology and photography and you seems to have combined the two. Was this ever your intention or do you think your interest in anthropology naturally influenced the images you have made? SF: When I graduated from Berkeley in 1971 I had a BA degree in anthropology with a minor in chemistry. Upon graduation I started taking trips to make photographs along the highway. I don't remember ever thinking at that time that my anthropology classes had any influence on my photography. However, ten or fifteen years later I was reflecting on the fact that I had not become an anthropologist and wondering what my life would have been like if I had. It dawned on me at that moment that my photographs had very much been influenced by my anthropology studies (and continue to be) and that a lot of the black & white darkroom work that I did in the 1970s was very influenced by my courses in chemistry. One anthropology professor who had a big influence on me was Alan Dundes who was a folklorist. He collected all kinds of oral folklore and gave these great lectures drawing upon his vast knowledge of many different cultures' folklore. In some ways, I have thought of myself as a visual folklorist who uses photography to collect material. AK: In 2012 your images inspire nostalgia. You had mentioned in a recent radio interview with Mary-Charlotte on KSFR that when you were making the images you did not have nostalgia in mind, you were just recording the world around you. However, it seems that your road trips were a bit like the childhood trips that you reminisce about – only you are the driver. In a sense perhaps there is a bit of nostalgia involved on a subconscious level? SF: Nostalgia is a tricky word: it implies a longing for, or romanticizing of, something in the past. With photography you can't make pictures of things in the past because your subject exists in the present, right in front of you. 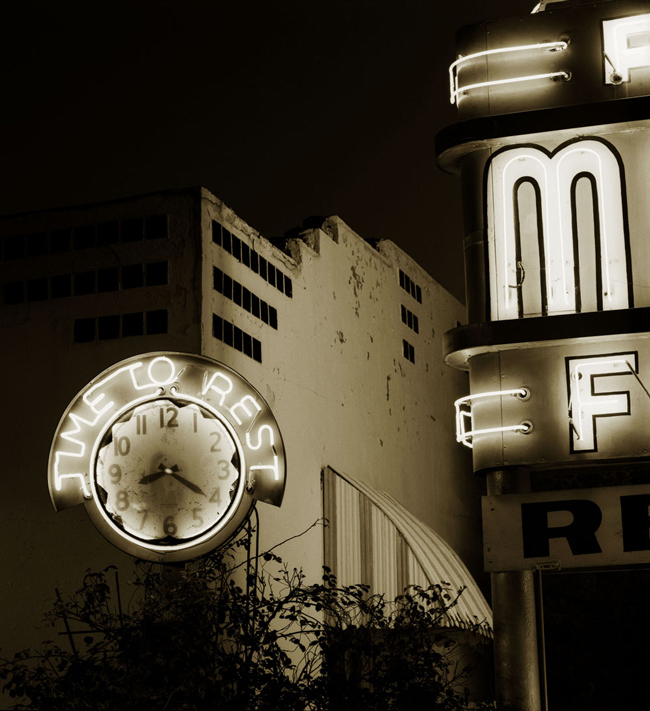 That has been the case with the things that I have photographed whether they are neon signs or drive-in movie theaters. Drive-in movie theaters were in full swing when I started to make pictures of them in the early 1970s. 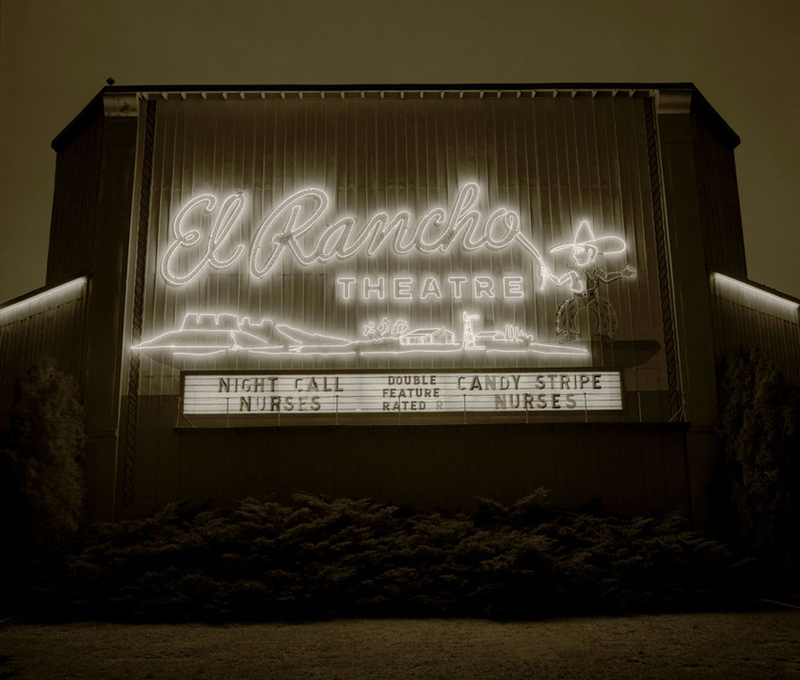 Having said that, I now look at many o the photographs that I have made over the years and it is obvious that much of what I have photographed is gone or in ruins (such as the drive-ins of pre-franschise neon motel signs). So I do think I had some kind of subconscious premonition that things were going to change; I think that my photographic interests have always been driven, to some extent, by an eye towards history. It is as if I had a sixth sense that what I was making pictures of was going to disappear and that what I was doing was important. AK: You have photographed many great neon mom and pop hotel signs and drive in theaters. 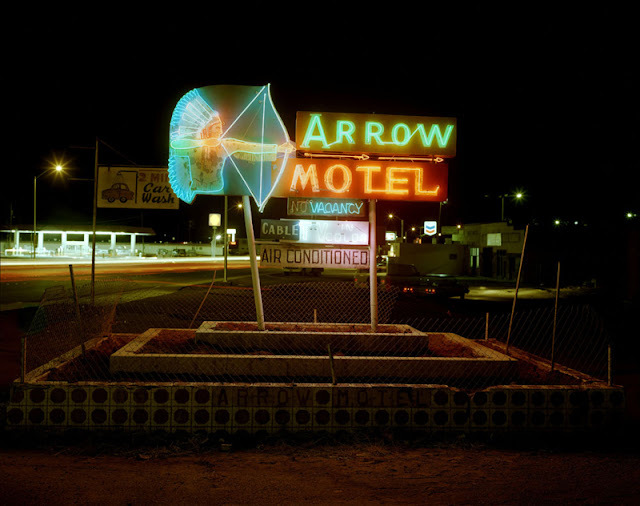 Do you have a favorite motel sign or theater, or perhaps a favorite story about the making on a particular image? SF: There are so many stories it is hard to know where to begin. In 1972 after I had been making pictures along the highway for about a year I reflected upon all the pictures that I had made so far and realized that something was missing. 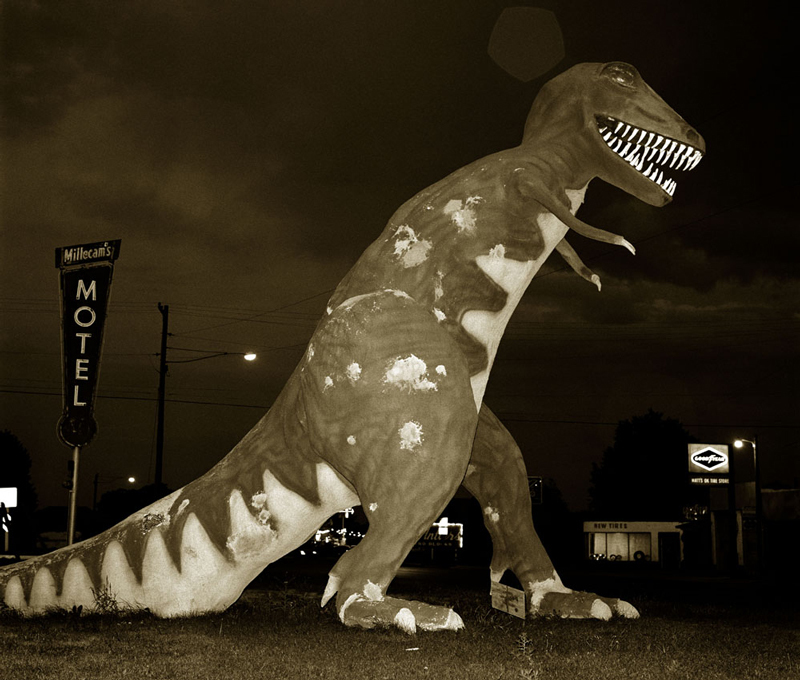 I had photographed tourists, truckstops, motels, billboards, truckdrivers and waitresses, snakepits and dinosaurs but some crucial aspect of the American highway was missing. It dawned on me that I needed to make some photographs at night. So much of the experience of travelling our highways had to do with driving at night, listening to funky AM radio stations and pulling into towns that you could see coming twenty miles away because of all the neon. So, on the next highway trip that I took I decided to try making some photographs at night--something that I was not even sure was possible. In Deadwood, South Dakota I spotted a homely little motel at dusk, with a row of bare light bulbs and a neon sign. 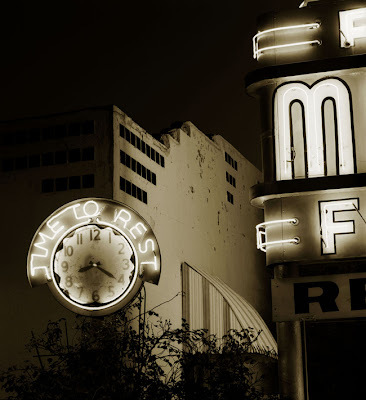 Through the window I could see a neon rimmed clock. Over the next hour, as it got dark, I shot a roll and a half of 120 film, bracketing my exposures. Two weeks later, back in Berkeley, I developed the film and was excited. The photographs of that motel looked great! I picked one to print and it is in Diesels and Dinosaurs. I love the quality of light at dusk and in this photograph the clock visible through the window tells me what time the photograph was made (8:20), and the second hand is blurred for about a second so it also tells me how long the exposure was. Ever since I have been very fond of photographs with clocks in them! AK: Some of your more recent images are of radio towers along the highway – which to me seems like a very natural evolution of your work. 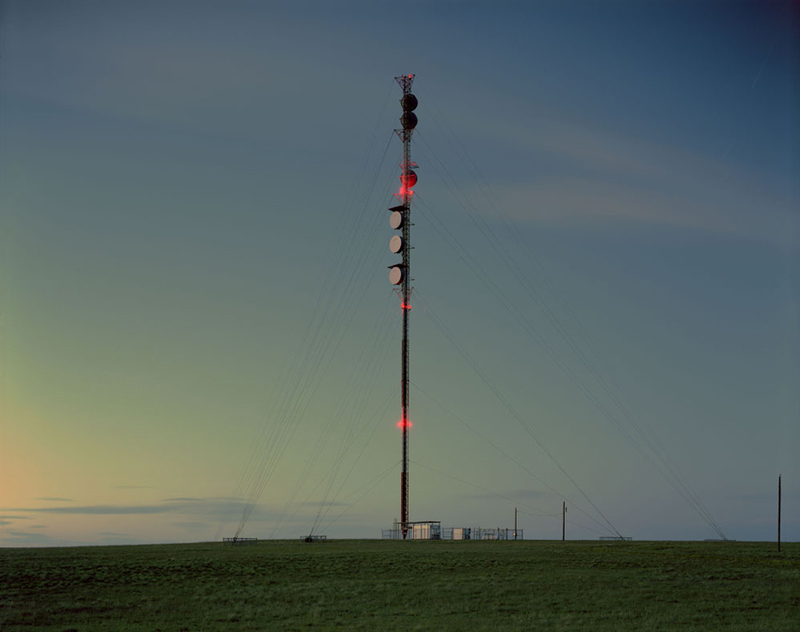 What is the story behind the first time you made a radio tower image? SF: The radio towers were made on the Llano Estacado region of western Texas and eastern New Mexico. I was working with five other photographers photographing that region as part of a survey project partly funded by the Southwest Collection at Texas Tech University in Lubbock, Texas. For years I had noticed radio towers out on the Llano because the region is so flat that anything that sticks up into the sky really stands out. I had been wanting to make a photograph of one at dusk for sometime; in the summer of 2004 the chance presented itself outside Levelland, Texas. In the picture that I made (which is about an eight minute exposure) there is the tower exactly in the center of the frame surrounded by a field of oil pumpjacks, some blurred from moving up and down, others not moving. The sky is dramatic with a parade of big, Great Plain's storm clouds. The next day I found out that the storm clouds flooded counties north of where I was and that several tornados touched down. Today, I look at that image and am surprised that I was even able to make it--if it is very windy I an unable to make the tower pictures because of the camera shaking during long exposures. The photograph is included in the book Llano Estacado: Island in the Sky published by Texas Tech University Press. Signed copies of Diesels and Dinosaurs, Gone, Llano Estacado, and Motel Signs are available for purchase at the photo-eye bookstore. Special thanks to Rick Dingus, who provided us with the images of Fitch making his photographs. Dingus' work is featured along with Fitch's in Llano Estacado.